What Pope Urban II had in mind when he preached the First Crusade was, I think, a variety of quite practical things. He hoped for the reunion of Christendom, which at that time was divided between the Latin Church and the Greek Church. He hoped also to recapture Jerusalem, which had been under Muslim rule for many centuries. And it was also a matter of giving the largely unemployed and over-aggressive nobility of France something to do, get them out of Europe and stop them devastating the ... lands. All these factors played a part in his mind. Whether he himself had any particular beliefs about the imminence of the End, that's really doubtful. But that is what was read into his speech by many uninformed people. ... He undoubtedly wanted the knights to go on this great military expedition. He had not foreseen that they would be followed by a mass of upstart peasantry. That, however, is what happened. And it was the peasantry which wreaked the great destructions, the murder of the Jews all down the Rhine and the savage assaults on Muslims by those who got to Jerusalem. What had Urban offered to the knights? What kinds of incentives did he offer? Well, from his point of view, it was, I think, a matter of salvation, that they could earn their eternal salvation in this way. What many of them looked forward to was getting an estate somewhere in the Holy Land, which many of them indeed managed to do. Tell me about those hordes and masses who joined along. And tell me a little bit about the destruction they wreaked, and where it happened, and about the first mass killings of the Jews that took place. The first mass killing of the Jews was carried out by the so-called People's Crusade, which attached itself to the army of knights and followed on behind them ... . They came largely from Flanders. [But] they proceeded down the Rhine, where there had been large Jewish settlements, ever since Roman times, the oldest Jewish settlements in Europe. And they were really destroyed by these hordes, who felt that as a necessary preliminary to the Second Coming, it was necessary to kill all Jews. This was not the official Church doctrine. The official doctrine was that all Jews must be converted to Christianity before the Second Coming. But one way of settling this matter was to kill them, and there would be no unconverted Jewish left. And that's what they did, in very horrible massacres ... . I often describe the Crusades as the foreign policy of the new reformed papacy of the late 11th and the 12th century. It was the papacy's attempt to reunite Christendom by bringing Eastern Christians back and by reconquering the Holy Land and especially the sacred city of Jerusalem from Islam. And in that sense, it was the genius really of Urban II to create a new form of lay piety. Whether we like this or not, it was an important form of lay piety that combined holy war with the idea of pilgrimage, and perhaps with certain eschatological and apocalyptic overtones, that so galvanized Europe that hundreds of thousands went off marching to the East to recapture the sacred apocalyptic city. What are the apocalyptic overtones of the Crusades? Some scholars have argued that the First Crusade was fundamentally an apocalyptic event, and that those who went believed that they were initiating the end times. I don't think the evidence supports that. One of the accounts of Pope Urban's speech does indeed have him emphasizing apocalyptic motifs, but that particular account of his speech was written some 15 years after the speech. And we have five different accounts of his speech, and they all emphasize different motifs. I do think the image of the apocalyptic city was probably important for some of the Crusaders. But I think that the reconquest of Jerusalem, the conquest in the year 1099 (we're just celebrating the anniversary) did a lot for emphasizing the centrality of Jerusalem in later apocalyptic traditions. And that may be the most important contribution of the Crusades to the apocalyptic mentality of Europe. Not so much that the Crusade itself was an apocalyptic event, the First Crusade; but that the reconquest of Jerusalem emphasized its centrality. And then when Christians lost the city to Saladin in 1187, the necessity of reconquering it often took apocalyptic aspects or apocalyptic overtones. Did Urban have a certain kind of war or crusader in mind? Pope Urban wanted only the knightly class to go off on the Crusade, and he felt that he was appealing to their religious motivation to become both pilgrims and warriors. But what he got was something quite different. He got a vast mass movement, which we know included many, many thousands of people who were not part of that knightly class. And I think that shows us just how significant the appeal to the Crusade actually was among all ranges of European society. For a knight, there were indulgences of a certain kind being offered. But did peasants see it in another way? Well, I think it's quite possible that some of the masses of peasants saw the Crusade in a rather different sense, and perhaps had a much more apocalyptic dimension to them. We have to remember, the status of the peasant in Europe at the end of the 11th century was really quite a difficult and impossible one. And the vision perhaps of going to Jerusalem and in some way sharing in some kind of millennial kingdom may have been far more powerful with the peasants than with the knights. But once again, our evidence is in many cases rather fragmentary about what motivated the peasants especially. We often know much more about what motivated some of the knightly participants. What happened in some of those cities, particularly around the Rhine? One of the most unfortunate aspects of the whole crusading movement, of course, was the fact that it marks, as many scholars have maintained, a significant change in the relationship between Jews and Christians, and some of the beginnings of the most savage persecution of Jews by the Christians in the massacres that took place along the Rhineland cities as the crusading peasant groups especially-- not so much the soldiers who wanted to get money from the Jews, but the peasants-- took on the terrible task of pogroms that slaughtered many thousands of Jews. Now again, if that can be tied to apocalyptic expectations, as some have argued, that is extremely significant. But the evidence is doubtful. What were the motivations for those massacres? I think the motivation for the massacres is really tied to the sense of "us" and "them." And if Christians were going off to reconquer the Holy Land from Islam, seen as the enemy of Christianity, it was a very easy but terrible step to take that any enemy of Christianity therefore was in the way, and should be destroyed. Do these massacres mark the beginning of a tradition of anti-semitism? What happened when the crusaders conquered Jerusalem? Well, I think what's amazing when we think about it here as we celebrate the 900th anniversary of that conquest--July the 15th, 1099--is that it succeeded. Because of course, to march armies of tens of thousands, both of knights and non-combatants, all the way across Europe, to have maybe one in 20 survive, and then to conquer the city of Jerusalem, seemed like a miracle. It even seems like a miracle to us today. But it was that miracle, of course, which gave Christians--unfortunately, I think--in the 12th century this sense of divine providence, that the city of Jerusalem was theirs; and of course then when the city was lost in 1187, made it an even more critical moment in Christian views of history and its coming end. When the crusading armies arrived at Jerusalem finally in mid-June of 1099, one of the things that they did was to immediately have a religious procession around the whole city, a penitential rite, because Crusade was also pilgrimage; and then to have an immediate assault on the city, because they felt again that God was on their side. That assault failed. And so then the Christians began to build siege machines in order to attack the city over the next few weeks. And then finally, in the middle of July (July 12th and 13th through the 15th) the siege machines enabled the city to be breached, the crusaders to rush in, and then the most terrible thing to happen: a slaughter, almost universal slaughter of Muslims and Jews in the city, which is still the worst stain on the Crusade, I think, that history leaves to us. It's difficult to know exactly how many people were slaughtered at the conquest of the city, but it seems to have been some tens of thousands. ... 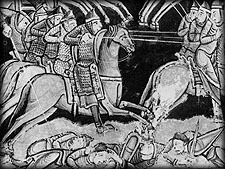 Crusading chronicles say that the blood from the slaughtered reached up to the knees of their horses. What is the legacy of the taking of the city for Christian apocalyptic mentality? Well, we have to remember that the city of Jerusalem is the apocalyptic city par excellence. And it's not just the heavenly Jerusalem, but it is the earthy Jerusalem. And so the miracle of the conquest of the city in 1099, and having it once again back in Christian possession, I think, enhanced the position of the earthly Jerusalem as the apocalyptic city, and gave it then a centrality that was even more powerful than it had previously.